The year is almost over, which means it’s time for the End of Year Book Survey, brainchild of the wonderful Jamie from The Perpetual Page-Turner! My reading goal for this year was to read 35 books. It was a bit lower than previous years, but I didn’t want to put too much pressure on myself, especially considering the fact that at the beginning of 2017 I had no idea what my life would look like at the end of it. I managed to read those 35 books, and I’m currently half way through the 36th. I’m pretty sure I won’t be able to finish that one before the new year, though, because I’ve got over 250 pages left to read and there’s only 4 more hours in 2017, which I won’t be spending with a book unfortunately. I had a fun reading year! Of course, there were so many more books I wish I’d read this year, but that would be the case even if I’d read over a 100 books. So, I’m pretty content! Most of my reads were 4 or 5 star ones; I guess that’s the advantage of not being able to read that many books and being extra picky about choosing my next read. Anyway, there are about a million questions to get through, so let’s get to it! I made pie charts! I got kinda nerdy about them and had to restrain myself from making about a million of them. They do illustrate my reading year pretty well, though. I’m especially pleased with having read 60% female authors. I can’t pick between these two, so I won’t. It’s The Hate U Give by Angie Thomas and Turtles All the Way Down by John Green. They both blew me away for different reasons and really made an impact on me as a person. They’re both definitely new all time favourites. I’m a big fan of Paul Auster’s writing, but I didn’t much like The Book of Ilusions, which I read recently. The story was alright, but the women in it were written terribly. I’m just really really done with that. Illuminae by Amie Kaufman and Jay Kristoff. I know everyone and their mothers raved about this, but I was a little sceptical because of the unusual format. But I loved it, and all the twists and turns shocked me in all the good ways. Probably The Hate U Give by Angie Thomas. The title of my review of it is “5 Reasons Why Everyone Should Read The Hate U Give by Angie Thomas“. Kind of says it all, right? I wanted to say Illuminae, but let’s mix things up (I’ll be answering Illuminae to loads more questions to come…) and say Six of Crows by Leigh Bardugo, which I loved! For sequel and series ender… I only read one sequel and one series ender, both of the same series. So let’s just say The Raven Cycle by Maggie Stiefvater in its entirety. Angie Thomas, but also Leigh Bardugo and Laini Taylor (I’m currently reading Strange the Dreamer). Persepolis by Marjane Satrapi. I started reading more graphic novels and comics this year and this was one of the first ones and it’s autobiographical (I don’t read much autobiographical work). It’s also about life in Iran and I know very little about that. It was both a very good book and very educational. I loved it! Illuminae. See, there it is again! The format together with the bone-chilling, high stakes story made it nearly impossible for me to put down this book! The Hate U Give or The Inexplicable Logic of My Life by Benjamin Alire Sáenz. I didn’t include that one with my favourite books, but it’s a close third. Starr from The Hate U Give. She’s one of the best charactes I’ve read this year and the first one to pop into my mind. Another one would be the foetus from Ian McEwan’s Nutshell. The Inexplicable Logic of My Life. Benjamin Alire Sáenz’s writing style hits me in all the right places, man. I cried reading this book. I never cry when I’m reading. Predictable but true: The Hate U Give. It’s such an important book and I still think everybody should read it! I was so happy to see it topped so many “best books of 2017” lists in mainstream media as well! Alice’s Adventures in Wonderland by Lewis Carroll. Yep. It was about time, wasn’t it? I liked it, but didn’t love it. True terror isn’t being scared; it’s not having a choice on the matter. Shortest: We Should All Be Feminists by Chimamande Ngozi Adichie: 52 pages (not really a book, perhaps, but it came in book form, so I’d say it counts). Longest: The Mists of Avalon by Marion Zimmer Bradley: 1009 pages (it took me over 3 months to finish this one). There it is again: Illuminae! This book was dark, man. I did not see that coming. This would be a pairing from The Raven Cycle that I cannot mention because of spoilers. I don’t really do OTPs, but I will go down with that ship! I’m all about realistic families in YA novels, so my answer to this one is the entire family dynamic in The Inexplicable Logic of My Life. I feel like I’m just repeating the same 4 or 5 books, but the answer to this one is Turtles All the Way Down by John Green. I’ve read all of his books and liked them all, but this is by far my favourite. Hmm, I don’t really give into peer pressure when it comes to reading, but I finally read The Mists of Avalon this year, which was partly due to my friend Aline’s recommendation. I really don’t know – I don’t think I’ve really had any fictional crushes this year. Maybe Kaz from Six of Crows? The Hate U Give. Obviously. I want to say Strange the Dreamer, but I haven’t finished that one yet so it isn’t part of the 35 books of this year. Perhaps it’ll be my answer for next year! So, the next best thing would be the island in Miss Peregrine’s Home for Peculiar Children by Ransom Riggs. Or Six of Crows. I can’t choose! The BFG by Roald Dahl! Such a wonderful read. There’s only one book that made me cry this year (or in the past 10 years) and that’s The Inexplicable Logic of My Life. I’d have to go for the last book I read, which is Vincent by Barbara Stok, which is a graphic novel about Vincent van Gogh’s life. It’s a Dutch book originally, but it’s been translated into English as well. I first came across it in a BookTube video by Ariel Bissett (who’s Canadian), and didn’t find out until later that it was a Dutch book! In fact, Barbara Stok is from the same city as me. Coincidences, eh? Anyhow, I’d definitely recommend this one to anyone interested in van Gogh! The Hate U Give, Turtles All the Way Down or The Inexplicable Logic of My Life. So, all the favourites. Illuminae! Because of the format, but also because of the story. It was so much darker than I expected it to be. The Book of Illusions by Paul Auster. I was just so disappointed! Auster is (or was – the jury is still out) one of my favourite authors, and it made me so mad and sad that an author I look up to so much appears to have such old-fashioned ideas about femininity and how women should be written. Oh man, this is bad, but I really don’t know. I spent a good deal of 2017 not blogging because of various reasons, and I’m still in the process of getting back into the “frequently reading other blogs” deal. I read blogs, but I’ve known most of them for longer than a year. 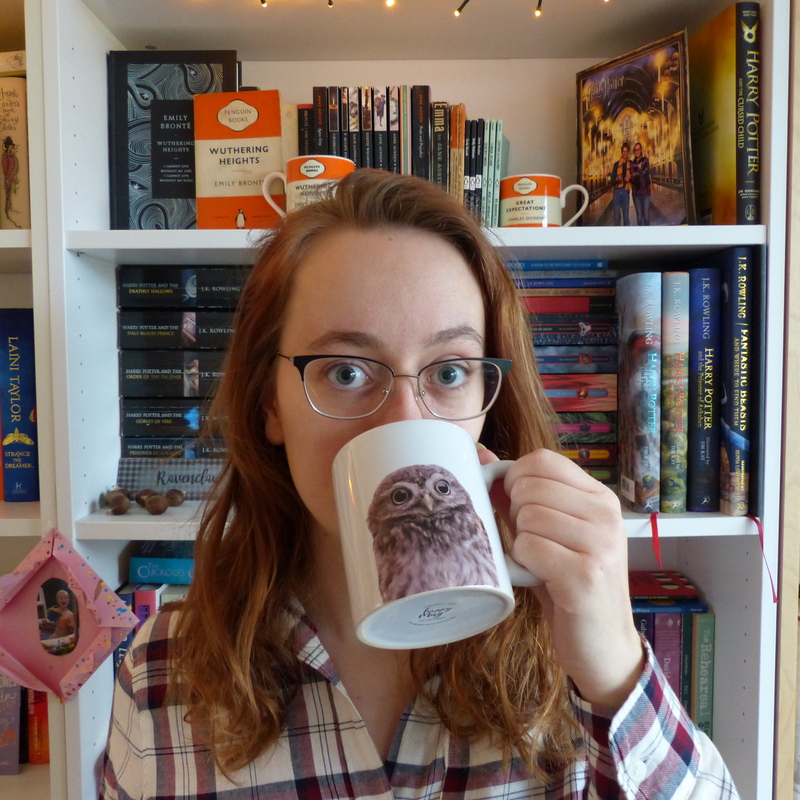 I have discovered a few new BookTubers, though, my favourite of which must be Katherine Lyle. Her voice is so nice and relaxing to listen to and I love what she has to say about books. Go check her out! My review of The Hate U Give! I’ve been wanting to mix things up a bit with my reviews to make them more interesting; working with lists or subheadings – that kind of stuff. My review of THUG was my first experiment and I think it worked really well! I guess I’ll have to choose my favourite recipe of the year! Even though that’s an impossible task, I’ve managed to pick one favourite: these cinnamon sugar blondies, which were divine. The only things I participated in this year are two readathons: Bout of Books 19 in May and BookTubeAThon in July and I had an absolute blast with both of them. I hope I’ll be able to participate in more readathons in the new year! When Benjamin Alire Sáenz retweeted my tweet about his book! He’s one of my favourite authors, so that was really cool! Making time for it all. This year was a bit all over the place for me, what with graduating and being unemployed, then working irregular hours at a book store and then finding a job with actual hours. It wasn’t until I started my current job in October that I really managed to get back into blogging – something I wanted to do since February. But now I’m back and I’m planning to stay! I’ve looked at this by views, because that’s way easier. The post that’s been viewed most this year is 20 Desserts Inspired By Literature, which is a post from 2015. The most popular post that I’ve actually written this year is: Why La La Land is My New Favourite Film of All Time. Which has nothing to do with what my blog’s about, of course, so let’s also mention the most popular post written this year that’s actually on topic: Turtles All the Way Down and the Importance of #ownvoices. My most recent recipe, which I’m really proud of! I made Christmas tree meringues, but according to my stats, it didn’t get a whole lot of views. They’re adorable! The only thing that comes to mind is that this is the year I worked in a book store! That’s the dream, right? I only worked there for four months and I didn’t have regular hours, but I’m so happy I now have the experience of working in a book store It’s hard work, and I found out retail isn’t really my thing (my anxiety didn’t always agree with the work), but it was so much fun as well. And I got a staff discount, which was nice. The only reading challenge I set for myself this year was the Goodreads one and I completed that one. I read 35 books! Tower of Dawn by Sarah J. Maas and The Handmaid’s Tale by Margaret Atwood. Okay, so that’s two books, but I don’t care. I bought Tower of Dawn immediately after it came out because I just had to read it, and now I still haven’t… And I’ve been saying “I’m going to read that next!” about The Handmaid’s Tale, so that has to happen soon as well. Both are on my January TBR! I have no clue what is or isn’t coming out in 2018 except for Obsidio by Amie Kaufman and Jay Kristoff; the third book in the Illuminae series. I still have to read Gemina first, but I have high hopes of that happening semi soon. A Thousand Perfect Notes by C.G. Drews a.k.a. our community’s own Paper Fury! I’m so excited to read Cait’s first (published) novel! …Obsidio again? Like I said, I have no clue what’s coming out in 2018. I want to keep up with blogging regularly and get back into reading and commenting on others blogs more as well. I’ve also decided I really want to start working on my Instagram and post more and better shots on there. There’ll probably be a more elaborate post on my reading and blogging resolutions in a couple of days, though, so look out for that! « Festive Fortnight : Merry Christmas! I have Persepolis on my bookshelf – I want to get to it pretty soon! Persepolis is such an amazing book! !